Full Price: $ 35.00 14% off! 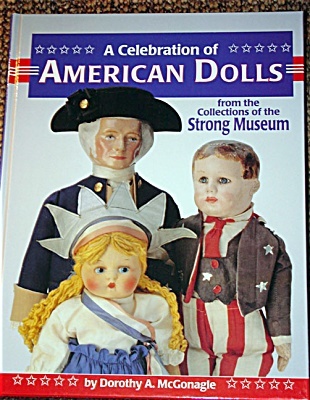 Dorothy A. McGonagle, 'A Celebration of American Dolls from the Collections of the Strong Museum', a hard cover book, has 144 pages, and it was published by Hobby House Press in 1997. It contains hundreds of mostly color pictures and photos, historical information on American doll designs, photos from Strong Museum in Rochester, N.Y. This book is perfect for historians interested in dolls. This book contains information on dolls from the 1600s, 1700s, 1800s, and 1900s. The dolls include home-made and manufactured, also American-designed, folk dolls, cloth, wooden, bisque, china, leather, celluloid, metal, paper dolls, composition, Izannah Walker, Martha Wellington, Emma Adams, Beecher Baby, Martha Jenks Chase, Alexander Doll Company (Madame Alexander), Raggedy Ann and Andy, Effanbee, Ideal Shirley Temple, Monica, American hard plastic and vinyl to the 1990s, American Artists. This book is a wonderful reference of doll types and doll history; it is not a value guide. This is a beautiful, informative book is in new and mint condition.